Gaming is a way of life for the family at C.P. Dean! While we are best known throughout Virginia for new pool tables, trophies/awards and billiard service, we also have decades upon decades of helping homeowners like you choose the best gaming table to fit your needs, budget and space! We are proud to offer a variety of gaming tables to fit your lifestyle, from the neighborhood poker game (texas hold’em, perhaps? ), to more sophisticated “2 in 1” gaming options! With the popularity of poker these days, we get all sorts of requests for convertible “2 in 1” tables, so you can maximize your space within your game room. 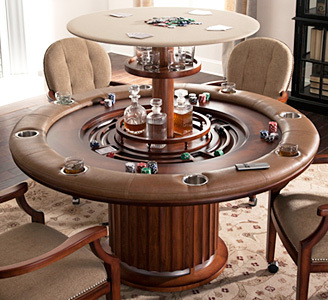 Consider the innovative Ultimate Gaming Table (left) from California House with its hidden bar that raises from the center with just the press of a button. C.P. Dean isn’t some big-box store – we take pride in our products, and that’s why we will deliver and install every single gaming table we sell, free of charge. Don’t go through the hassle of renting a truck, bribing your buddies and staring at an assembly guide – we’ll take care of all of that. Just kick back, relax, and enjoy your new gaming table! 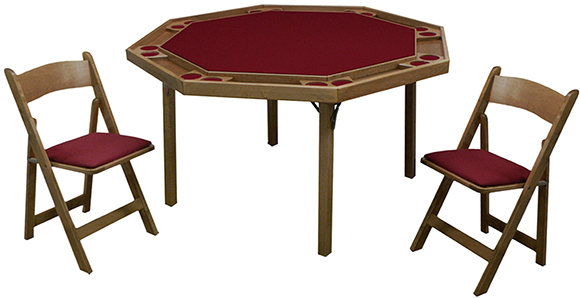 Click Here to view the California House Gaming Table online catalog. This 8-player table features our exceptionally durable “Sur-Loc” Steel folding leg mechanism for years of trouble-free use. With its uncomplicated lines, this spacious table will fit in virtually anywhere. Available in Fruitwood/Walnut, Natural, Pecan, Mahogany, Ranch Oak, & Spanish Oak finish with cloth colors in Black, Dark Green, Bottle Green, Red, & Burgundy. Click here for more details! If you have any questions about what type of gaming table, poker table, Ping Pong table or Foosball table will best fit your lifestyle and budget, by all means call us at (804) 355-6588 or contact C.P. Dean online! We have the knowledge, products and vast experience to help customize your gaming experience for maximum enjoyment with minimum headache!